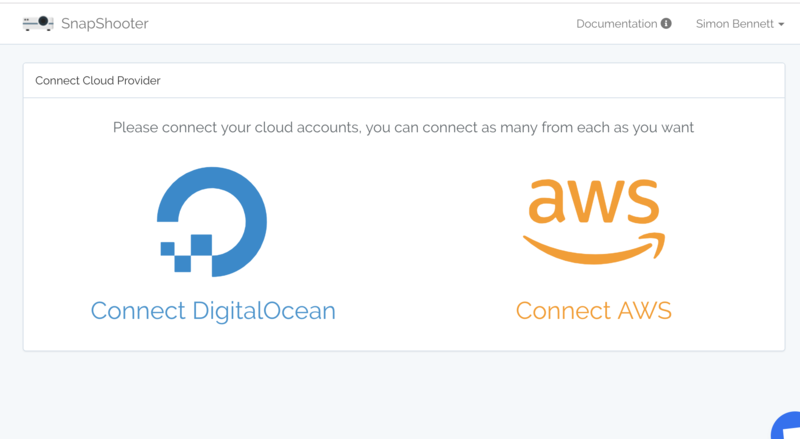 Keep your DigitalOcean & AWS servers safe! Perform snapshots from every hour to every day. Timezones and schedules supported. E.g. Set nightly backups when you want. Advance backup rotation retention policies allows you to keep as many; daily, weekly and monthly backups as you want. Get back online fast if the worst case happens. Restoring whole server snapshots are easy and get you running in no time. DigitalOcean snapshots are kept secure inside there infrastructure. AWS snapshots are also kept secure inside AWS's infrastructure. Connecting DigitalOcean is a total breeze with a simple aouth request to grant us access to take snapshots on your half. 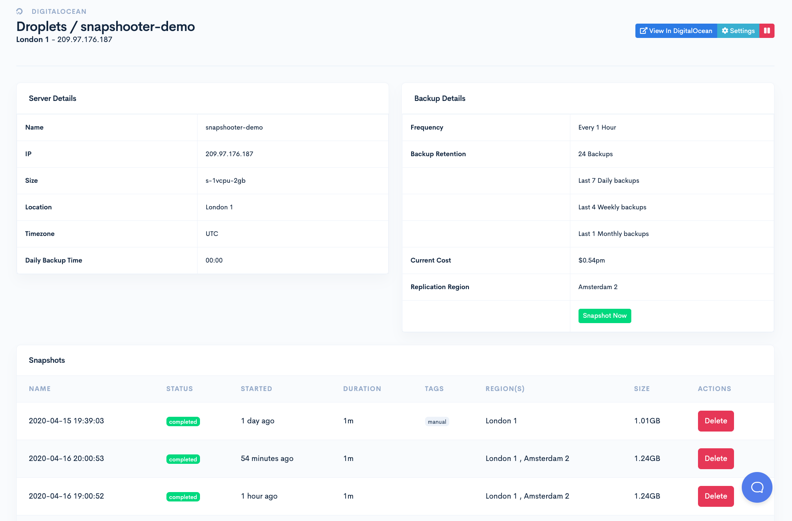 We pride ourselves on the simple setup for backups, find the resource in our dashboard, set the frequency from daily to hourly then and the number of past backups you want to keep, daily, weekly and monthly. Been using @SnapShooterio to manage my @digitalocean backups recently, very happy with the service - super quick and great support. Looking for more than one automated @DigitalOcean backup/week? 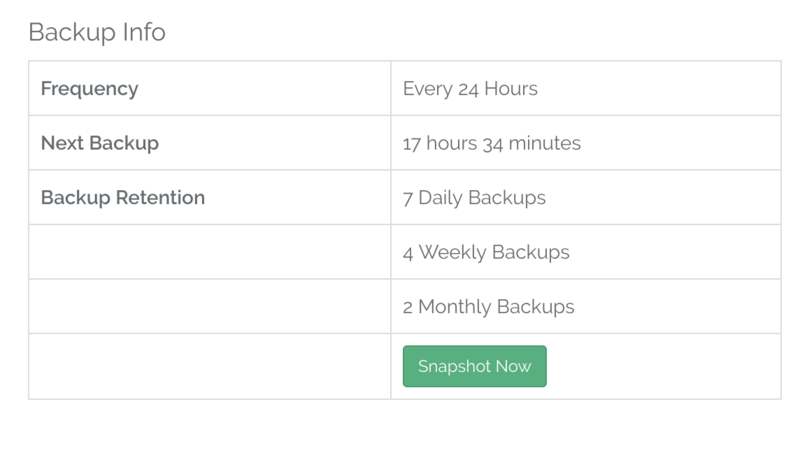 @SnapShooterio let's you create and fully customize your own backup schedule! We also offer a self-hosted version for enterprise users. Email Us for more details and quotes. Easy to get started. 3 Step process. What counts as a Cloud Resource? How often do you Snapshot? We currently offer taking snapshots every 1, 2, 3, 4, 6, 12 and 24 hours. Do you work with databases? Please note that taking a snapshot on a extremely active database server may result in a incomplete backup. We recommend you use a export program, such as mysqldump or pg_dump. The exported file can then be safely backed up and restored. What are Droplets and Volumes? Droplets are the name DigitalOcean gives to their virtual private servers. Volumes are network attached drives you can connect to a Droplet to give it more space. We process payments through Stripe, They accept all major credit and debit cards: Visa, Mastercard, American Express, JCB, Discover and Diners Club. Couldn't I do this myself? Yes you could communicate with the DigitalOcean Api yourself. Like all online service you could create your own version which you would have to run and support 24/7. We feel we have created an amazing service so you don't have to worry and can carry on with devops. Why do I need to back up my digital ocean account? It's always a very good idea to have backups of your droplets (servers) and volumes (network drives). The main advantage of using snapshots is how fast it is to restore your servers, much more quickly than restoring from offsite backup, as the backup is already inside DigitalOceans network. Do you turn my server off? No, we take snapshots of your servers while they are online, we do not turn on or shutdown droplets. SnapShooter was formed at the start of 2017 after Simon was frustrated with the DigitalOcean offering while trying to protect a clients fleet of WordPress DigitalOcean servers. The idea of SnapShooter was born, for its first two years we focused solely on DigitalOcean servers and then DigitalOcean volumes backups but at the end of 2018, have applied the learned learnt with DigitalOcean to expand out to AWS.